There are numerous elaborate and comprehensive textbooks and pointers on stroke. Nevertheless, busy clinicians are continually bombarded with new knowledge for an infinite number of medical conditions. It turns into a problem for them to tease out the important data that may help guide them through the care of the affected person they've right earlier than them. This handbook was thus conceptualized with both the busy clinician and the stroke affected person needing urgent therapy in mind. By providing only important info in an ordinary and user-friendly structure, it assists clinicians in making real-time selections quickly and successfully with actual step-by-step guides on specific points related to the care of stroke patients. The use of this sensible handbook is instinctive with the matters arranged in chronological order, simulating the precise scientific situation from a prehospital setting, session in the emergency room, admission to the hospital, to secondary prevention in the clinic. With contributions from over 30 stroke consultants in Southeast Asia, this handbook is extensively applicable in different medical settings and will definitely enchantment to stroke specialists, normal practitioners, nurses, paramedics, and medical students alike. Contents: TIA and Acute Stroke: Prehospital Stroke Evaluation and Triage (HC Chua); Stroke/TIA versus Mimics (RN Gan); Admit to Hospital versus Clinic (NC Suwanwela); Anterior versus Posterior Circulation Syndrome (MP Yumul & J Navarro); Brain Imaging (CCT Lim); Admit to Stroke Unit or Ward (NV Ramani); Stroke Scales and Classifications (RN Gan); Primary Admitting Orders and Stroke Medical Pathway (AA Noor Asiah & W Soo); TIA and Acute Ischemic Stroke: Fundamental Investigations (JL Padilla); Thrombolysis (rTPA) for Acute Ischemic Stroke (RN Gan); Antiplatelets (JL Pascual & HM Chang); Blood Strain in Acute Ischemic Stroke (A Roxas); Diagnostic Assessments for TOAST Classification (D Ratanakorn & J Keandoungchun); Anticoagulation (H Basri); Ischemic Stroke in Young Adults and Cerebral Venous Thrombosis (JL Pascual & CLH Chen); Acute Intracerebral Hemorrhage: Diagnostic Exams (SJ Agustin & RN Gan); Medical and BP Management (RN Gan & E Wang); Surgical procedure (A Chua); Acute Subarachnoid Hemorrhage: Diagnostic Checks (KJ Khu & A Chua); Medical Administration (KJ Khu & A Chua); Surgical procedure and Intervention (SK Dinesh & I Ng); TIA and Acute Stroke: Other Administration Issues: Blood Sugar in Acute Stroke (R Singh); Fluid and Vitamin in Acute Stroke (C Chua & MCZ San Jose); Rehabilitation, Bodily, Occupational and Speech Therapy (S Young); Worsening after Stroke (RN Gan & KE Lee); Increased Intracranial Pressure (EV Collantes & ES Bitanga); Fever and An infection (MJ Mamauag); Deep Vein Thrombosis and Pulmonary Embolism (RMR Divinagracia); Myocardial Infarction in Acute Stroke (BPL Chan); Publish-acute Care and Prevention: Antithrombotics: Antiplatelets and Anticoagulant (RN Gan et al. ); Blood Strain and Antihypertensives (SH Lee); Cholesterol (MP Yumul & NV Ramani); Diabetes Mellitus (A Aquino); Life-style Threat Issue Management (MCZ San Jose & C Chua); Carotid Endarterectomy and Angioplasty/Stenting (P Rivera). Thank you for reading the article about The Stroke Clinician's Handbook: A Practical Guide to the Care of Stroke Patients. 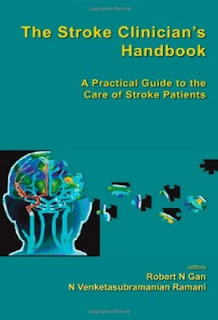 If you want to duplicate this article you are expected to include links http://helpdesksoftwarepdfebooks.blogspot.com/2013/07/the-stroke-clinician-handbook-practical_4.html. Thank you for your attention.